Generation C (Gen1) bugpin long taper magnum with 27 needle count is regularly used for color fills and finer shading on larger areas. Original Generation C (Gen1) T-Tech needle cartridges have a patented design. Each cartridge has a standard twist lock mechanism, compatible with most conventional tattoo machine grips. It securely locks the cartridge in place for safe tattooing. The long taper bugpin magnum configurations are available with 11, 13, 15, 17, and 27 needle points. T-Tech bugpin mags are weaved from a flat needle to allow for better ink dispersion while tattooing. Long Taper Bugpin Magnums are #10 in diameter (0.30mm) with a 3.5mm long taper. Bugpin mags are perfect for fine blending, shading and covering large areas. We process all payments via PayPal, including all major credit cards and money orders. Visa, MasterCard, American Express, and Discover. We ship worldwide via UPS, DHL, Canada Post and FedEx within two business days of processing the order. We ship from our warehouse in Toronto, Canada. Your exact shipping costs will be available at the checkout. Please note that international orders may be subjected to your local tariffs, customs, and additional taxes upon delivery. Canada Post - US ONLY: delivers 3-5 business days to main cities via USPS only to USPS deliverable addresses. 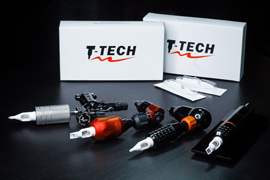 T-Tech tattoo needle cartridges fit most conventional grips and tattoo machines on the market. The cartridges are tested for fit with T-Tech grips only and we cannot guarantee fit with other brands. For information about the cartridge casing sizes please visit the features page. Each box contains 20 individually packaged needle cartridges of your chosen long taper bugpin magnums configuration. All cartridges are EO sterilized and individually packaged. © 2019 T-TECH TATTOO DEVICE INC. ALL RIGHTS RESERVED.